And so we begin… the end. 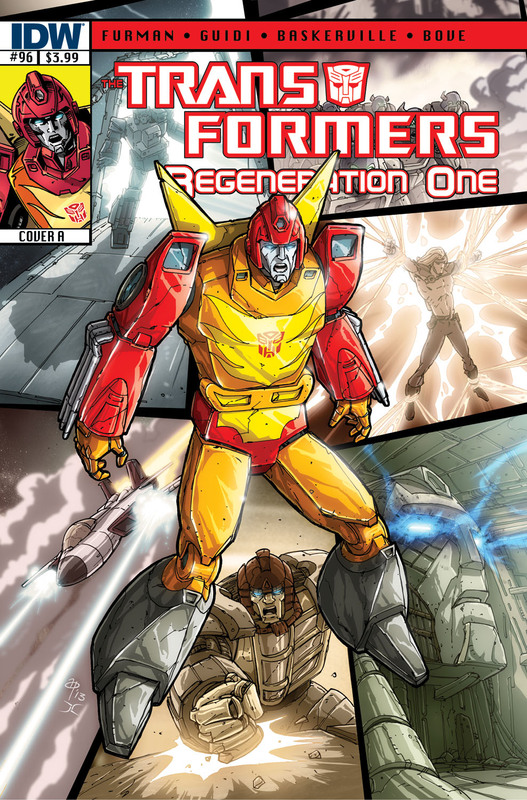 100 (or so) issues and 30 years in the making, the original grounding Transformers comic and series starts the countdown to its epic conclusion with the release (this week, November 27th) of Transformers: Regeneration One #96. The final arc kicks off with both aftermath (of #95’s epic battle against Bludgeon’s Blitz Engines) and the opening thrusts and feints in what is to be a truly double-edged conflict, one that will come from without and within (with the lines blurring constantly). As is my habit at such pre-release moments, my scribely digressions on the issue follow. Beware of slight spoilers if you wish to enjoy the experience without even a whiff of what’s to come. But, as always, my aim is to tease and torment rather than reveal. So begins The War to End All Wars, the pulling together of all the threads we’ve been dangling for the past 15 (or so) issues. Omens and portents abound on Cybertron as Rodimus Prime struggles to understand the often cryptic clues scattered by Primus on his journey through Zero Space, and uppermost in his mind is the question: who is Jhiaxus? And perhaps more importantly, what’s he been up to since he deleted himself from Cybertron’s history many millennia ago? But more immediate concerns, such as the Primordial Cybertronians and rogue (time-lost) Decepticon Galvatron take precedence this issue, but that doesn’t stop ace investigators Nightbeat and Bumblebee beginning their search. While on Earth, the building of a Space Bridge to unite two mauled and battered worlds/populations, brings its own clanging chimes of apocalyptic doom. Let me just say, that the omens for a happy ending are not good, and nothing (and no one) is quite what they seem. For a full preview of the issue, check out the official IDW offering here. Otherwise, just clench your bits and wait for Wednesday. Trust me, it’ll be well worth a few grimaces. You are currently browsing the simon furman blog archives for November, 2013.